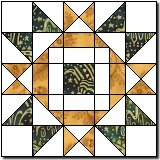 * There can be a combination of techniques needed within each block such as regular piecing, paper piecing and regular template piecing. * They all need very precise cutting and piecing. * You need to pay close attention to the diagrams and written instructions. * Some of the blocks have lots of small pieces so just take it slow and you'll see they can be done. * A couple like Lemon Star involve a few set in seams. You need to follow the directions carefully, and then it's do-able. Some of the star patterns are assembled using the paper piecing method. Go to paper piecing instructions and here you will be taken through a paper piecing tutorial. It will take you through this technique whether you are new to paper piecing or would just like to refresh your skills. I have grouped the blocks according to their finished size. If you are wanting to reduce or enlarge any block you can do this by using a photocopier. Go to new block size chart and scroll down to the New Block Size chart. I have given instructions below the chart for its use. 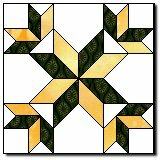 Following is some historical information about some of the star quilt block designs displayed above. Triangle Star: The Triangle Star is a circa 1920 block, and is also called "Star Diamond".